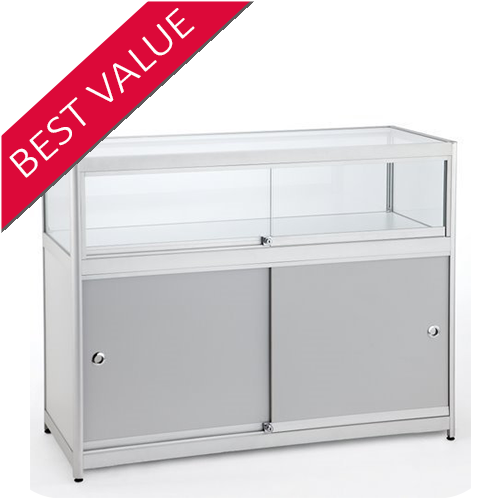 Toughened safety glass (8mm Shelves, 6mm Sides). LED Lights. (4 Lights Included). Supplied Flat packed - Assembly instructions are enclosed. Delivered flat packed for easy self assembly and to save on delivery costs, our glass showcase displays are a great addition to many types of retail outlet. Made from high quality Aluminium and toughened glass they are built to last. Our Aluminium Showcases are big and heavy items so they can be tricky to deliver. We will place your showcases on a pallet and use high quality steel banding to secure them in place, if you have ordered other smaller items they will be placed on the top of your pallet. Once we have all of your order on the pallet we use a high quality, clear shrink wrap to protect everything during its journey to you, we even use thick protective corner strips to stop any edges getting damaged.